Workplace Insanity: Make a Decision! You’re in a stressful situation where you, your group, your organization, and/or your company can proceed in a number of possible ways. The alternatives seem clear, but those in authority appear unable to make a decision on which way to go. They want yet another study, to gather yet more data (although the data seem clear), to bring in yet another specialist to review the situation, or myriad other delaying tactics. There reaches a clear point by when a decision must be made, and this point has passed. It is time for someone, anyone, to make a decision, so efforts can move forward! What’s wrong with these people! This is an all too common situation in many organizations today. Those with the responsibility to make decisions seem reluctant to make them, adding delay to an already tight project plan and schedule. So why won’t people make decisions when such decisions are clearly required, when they are clearly the ones with the responsibility? 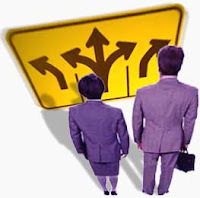 The person tasked with decision-making is concerned that he/she may make the wrong decision, forever branding him/her as a poor decision-maker, and as someone whose judgment cannot be trusted. The person tasked with decision-making is truly uncertain, unwilling to say so, and is concerned that others will recognize his/her uncertainty and view it as a weakness. The person tasked with decision-making is more concerned with his/her own position in the company and with climbing the corporate ladder, and is afraid that this decision may limit his/her position or advancement opportunities (more so than whether the decision is right or wrong). The person tasked with decision-making is more concerned with being blamed for a poor decision than with making a well-reasoned decision and bearing the consequences of that decision. He/she would prefer that someone else make a decision than he/she get personally blamed for a poor decision. I’m sure you can come up with a list of other reasons/excuses why people refuse to make timely decisions. The excuses don’t change the fact that a decision is needed, and can’t be delayed any further. What should the proper response be for the decision-maker’s fears of actually making a decision? Immediately get together the relevant parties necessary to ensure that all knowledge available is represented, get the additional information you need to properly inform your decision, and then make that decision! Talk with others you think may view your decision poorly, address their concerns, and then make that decision! Talk with those who you think may view your position or potential for advancement poorly, address their concerns, and then make that decision! Talk with those who you fear may blame you for a wrong decision, let them understand your reasoning, gain their concurrence, or address their concerns, and then make that decision! We all have times when we feel indecisive, or uncertain, when the choices are unclear, or where a wrong choice could be catastrophic (or so we think). Still, the need for a decision now is critical. That decision may even be to delay until specific information is available, but that is still a decision, with consequences of its own. When such demands are upon you, quickly gather whatever further information you need, consult with those whose advice or expertise you need, and make a decision!